Speaking to MCV, Activision Publishing boss Eric Hirshberg dismissed the threat of Battlefield, and even thanked its bitter publishing rival for hyping Modern Warfare 3. "It sounds trite but it's true: we focus on what we need to do to make the best games we can," he said. "We don't pay much mind looking at what the competitors are doing. I know they are focused on us... well that's all I'll say. "Well, I think EA might talk about our games in the press more than we do. "So, the first thing I say to them is, 'Thanks for the assistance in building awareness.'" Battlefield 3 and Call of Duty: Modern Warfare 3 are set to go head-to-head this November in what is quickly becoming one of the biggest grudge matches in gaming. In the build up to release, EA has been aggressive in its desire to overthrow COD. Last month EA ramped up the saber rattling, describing Battlefield as "superior" to Activision's franchise in every way. "We know we have a big competitor," CEO John Riccitiello stated. "But head-to-head with Call of Duty in Q3, we have the superior game engine, a superior development studio, and a flat out superior game. Our goal is to significantly gain share in the huge FPS category and to put the other team on defence." According to Riccitiello, Battlefield 3 pre-orders are up 700 per cent "versus the same period before the launch of Battlefield: Bad Company 2". "A lot of people are telling us they want to play this game on day one," he insisted. Earlier this year, Riccitiello claimed EA and Activision would spend a combined total of around $200 million on marketing their respective shooters later this year. "This game is designed to take that game down," he explained, referring to Battlefield 3. "If you're looking for a battle of the titans – Red Sox vs Yankees... Microsoft or Google - and what the tip-off point is for this holiday season, this is it." Activision's Hirshberg, however, remains unconcerned. "But when you think about it, we've had tough competition every year for Call of Duty," he continued. "It's never been easy. This is one of the most competitive genres in one of the most competitive industries. Last year we had Halo: Reach and Medal of Honor, and it's not like they weren't amazing developers gunning for the top of this mountain either. And it's the same this year – Gears of War is back along with lots of other games. "So, of course, we take all the competition really seriously. But at the end of the day I really mean it when I say we are focusing on the finish line, not the competition. We are making the best game we can, and are throwing every resource, innovation and all the creativity we can at it. And hopefully that will maintain our position." Last month Activision made Modern Warfare 3 official after a huge leak revealed story and multiplayer details. 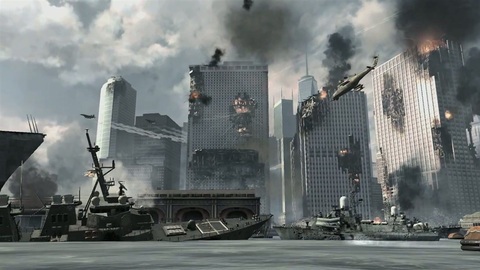 MW3 launches on 8th November. Battlefield 3 is rumoured to launch in the same week.